Finally, I managed to enable HTTPS on my own blog! I opted for a quick-and-dirty solution based on a self-compiled version of HAProxy in front of WordPress, statically linked to OpenSSL 1.0.2, in order to serve Certificate Transparency information during the TLS setup. I released a new version of my web application RIPE Atlas Tracepath: v0.3.0. It reads results from RIPE Atlas traceroute measurements and shows Autonomous Systems that probes go through to reach the target. UPDATE: new versions have been released since this post, with new features and bug fixes: please take a look at the project’s page on GitHub. In the beginning it was a simple Python script/CGI; the new release has been totally rewritten, it’s now based on the D3.js visualization library and uses a more elegant Python backend based on Flask/WSGI. 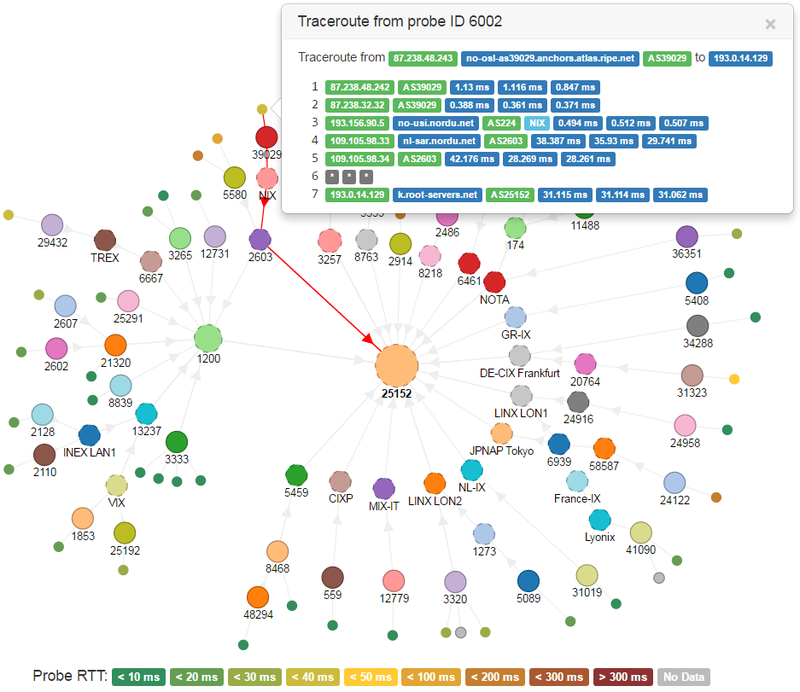 Among the new features, probes are also displayed and linked to their origin AS; for those that completed the traceroute toward the target the avg RTT is also rendered in form of a scale of colors. Multiple Autonomous Systems can now be selected and moved together on the graph, in order to obtain the layout that best describes the analyzed scenario. More details can be found on the GitHub page; feel free to use/edit/fork/improve it as you whish! A couple of days ago CloudFlare announced its public alpha release of their DNSSEC implementation. Since they are using the “recent” Elliptic Curve ECDSA P-256 (RFC6605) I wondered how many resolvers can have problems with signatures validation so I wanted to take a peek at the current situation as seen by the RIPE Atlas probes network.